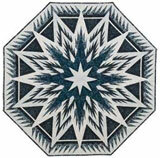 This past weekend, I vended at the Pride of the Prairie Quilt Show...an excellent guild show, I might add! 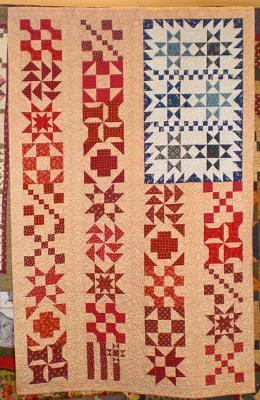 This intriguing take on a patriotic quilt was designed by Vicki Olsen, one of the owners of Sew Many Antiques. Patriotic, but not cutesy. 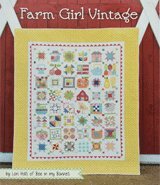 Not just for the Fourth of July, this quilt is just perfect for year round duty adorning a wall in your home. 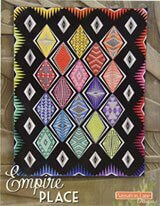 The sampler quilt pattern has eleven different blocks in it. A field of stars on a white or cream background; the stripes are stitched with tans and reds. 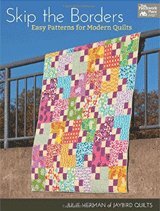 On the pattern Vicki recommends the use of the Easy Angle® and Precision Trimmer 6™ for the half square triangles and hour glass quilt blocks, and for squaring up your stitched blocks. I love it when designers share their favorite tools! I hope you enjoy this quilt as much as I did! 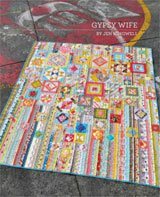 PS If you're closer to the Plainfield/Oswego, IL area, the gals at Prairie Stitches Quilt Shoppe picked up some "Old Glory" patterns for their store, but I bet they'll go fast!